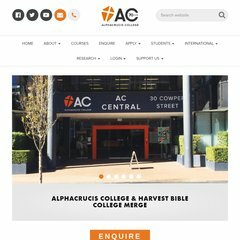 Topics: Alphacrucis College, Faculty And Staff, Pdf Documents, Students â–¼, Future Students, and How To Submit An Application. The estimated 91 daily visitors, each view 1.90 pages on average. Its IP Number is 119.225.212.83. Its 2 nameservers are ns1.tpgi.com.au, and ns2.tpgi.com.au. PING (119.225.212.83) 56(84) bytes of data. Pinging the server, resulted in a 636 ms response.